Marblehead, Mass. – The Marblehead Female Humane Society [MFHS], the oldest philanthropic organization in Marblehead and among the oldest in Massachusetts, will be celebrating its 200th Anniversary throughout 2016. Marblehead Female Humane Society 200th Anniversary Co-Chairs Barbara Miller and Judith O’Leary present the organization’s new logo. The design is based on Bob Baker’s original logo and tagline concepts and produced by graphic designer Peter Schalck. On November 19, 1816, the Marblehead Female Humane Society was formally organized by a membership of 125 women with the objective of helping the indigent, sick and infirm at home. The idea for the Marblehead Female Humane Society was first proposed by Reverend John Bartlett in response to the town’s unusual level of poverty after Thomas Jefferson’s Embargo of 1807 and its impact on fishing and commerce; the devastation of The War of 1812; the seizure of American ships and impressment of American sailors into the British Navy, and the year of “no summer” in 1816 when there was a frost every single month of the year causing gardens and crops to fail, according to a brief history of the Society written by Martha Bessam Gorman in 2003. “There was definitely a great need for an organization to help the poor,” Gorman wrote in her book. Bartlett came to Marblehead in the spring of 1811 as the pastor of the Second Congregational Church. A graduate of Harvard College, he was already well-known in Boston where he had served as Chaplain of the Almshouse of Boston from 1807 to 1810, and had initiated the movement which resulted in the founding of McLean Hospital and Massachusetts General Hospital, according to Gorman’s history. Barbara Miller and Judith O’Leary are the co-chairpersons of the MFHS 200th Anniversary Celebration. As the society was looking forward to the 200th Anniversary Celebration, the group turned to Marblehead resident Bob Baker, founder and president of Baker Advertising, to design the organization’s first logo. Baker’s career has spanned publishing, advertising and prose writing. A recognized advertising and creative talent, he is a winner of New England advertising’s top creative award – The Hatch Awards Best of Show, was named one of “The Top 10 Creatives in New England” by Ad East, and honored by The Advertising Club of Boston for a career of excellence in advertising combined with excellence in the arts. In Marblehead, he is well known for the foot outline-with-holly-on-toe logo he designed for The Marblehead Chamber of Commerce’s Christmas Walk, for the seagull logo for Marblehead Savings Bank, and the now-iconic sailboat in the wine glass for The Landing Restaurant. Bob Baker of Baker Advertising, with the “lighthouse/Victorian woman” logo as he designed it for the Marblehead Female Humane Society. Baker says, “When I heard what The Society’s mission was and how it’s still advancing that mission, I found it incredibly impressive.” And so the creative process began. 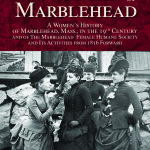 The unveiling of the logo heralds the beginning of a year-long celebration that includes the publication of a book MFHS specially commissioned to be written and researched by Marblehead author and historian Bob Booth that is scheduled for publication in the spring; a lecture series in conjunction with the Marblehead Museum, and a 19th century inspired tea party in September, according to Miller. In February, MFHS will issue an invitation to the Marblehead community to join the historic organization during the Society’s 200th Anniversary Celebration year. Membership is open to men and women. And the Society still maintains membership dues at 10 cents per month or $1.20 per year as first established in 1816. Donations of any amount are always appreciated.